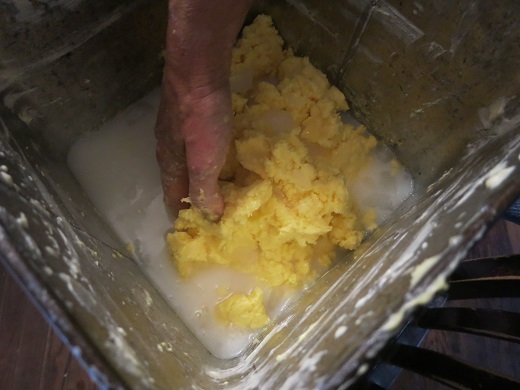 Making butter in our five gallon 1917 Dazey butter churn, just as good a tool today as it was one hundred years ago. Washing butter in ice water helps keep it firm to be worked and formed into half-pound butter balls. Topping mangels in the field. 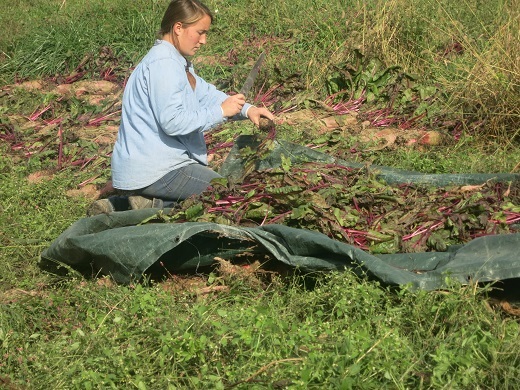 Topped roots are bagged in used feed sacks and go into the root cellar for a few weeks of aging, after which they are more easily digestible. The tops will be fed out to the pigs over the next couple of weeks, providing a valuable element of green food in these late fall days.